Dexter breaks ratings records again, despite facing competition from the most-watched Emmy Awards and football. 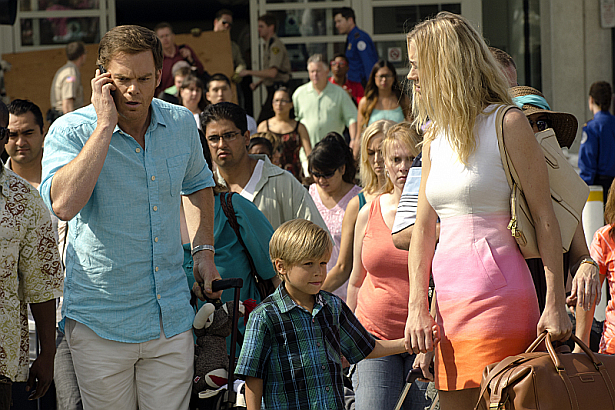 Dexter went out on a high note, drawing 2.8 million total viewers to the first airing of its series finale. On this week's ratings, the series finale "Remember the Monsters?" averaged about 2.8 million viewers, and hit all-time high according to Nielsen estimates that include same-night DVR playback. This is a 17% rise from last week (2.4 million) and edges out the show’s seventh-season finale of 2.75 million. Counting its repeat airing late Sunday night, the Dexte” finale drew 3.3 million viewers — up from the 3.2 million for its eighth-season opener in June.